The Legal Genealogist refused to trade her lederhosen for a kilt just because the AncestryDNA ethnicity estimates might have said so. And I refuse to add cousins to my family tree — even cousins I might like to be able to add — just because of some app from Ancestry either. Yesterday, Ancestry released its We’re Related app. It’s available for the iOS devices via the Apple Store or for Android devices via Google Play. It’s free, and it’s definitely entertaining. It’s a way to search through your family tree to determine who you might be related to who is famous somehow. A President of the United States. A musician or composer. An actor or actress. An author. Business magnate. Criminal. Lawyer.1 Educator. Historical figure. Military figure. Philanthropist. Religious figure, Royalty. Sports figure. I don’t like, not even a little, that it requires me to sign it with my Facebook account, thus giving both Facebook and Ancestry a data point each didn’t have before (Facebook has no reason to know my Ancestry log-in, Ancestry has no reason to know my Facebook log-in). So keep that in mind before you try this. So I picked my own tree, had to figure out how to turn the darned thing on and where I’d hidden myself among the realm of the living folks, and told it to go ahead and tell me all about my famous relatives. • The ninth cousin of the 44th President of the United States, Barack Obama, as we both descend from Richard York (1650-1784). Only one problem: the line of descent is utterly unproved and not in my tree data at all. I don’t list Susannah York as my 5th great grandmother, nor Joseph York as my 6th great grandfather, nor Jeremiah York as my 7th great grandfather nor Richard York as my 8th great grandfather — and as far as I know there’s not a shred of documentary evidence to support it. • The eighth cousin once removed of Johnny Depp, through our common ancestor Elizabeth Markham, whose daughter Mary Marshall was the mother of my 5th great grandfather William Wiseman. Only one hitch. Nobody has ever come up with a smidgeon of proof as to William’s parents. None. • The seventh cousin once removed of William Jefferson Clinton, the 42nd President of the United States. Through that same utterly undocumented line of descent from this York family, this time through Jeremiah. As to whom Clinton may be a descendant. As far as I know, I’m not. The eighth cousin once removed of Demi Lovato, through my Pettypool line. The app, however, pegs the common ancestor as Martha Ragsdale, wife of Seth Pettypool, and the best minds in our Pettypool research say that there is no evidence whatsoever that Seth’s wife was a Ragsdale. But if she descends from Seth, then we are cousins, but not provably on a Ragsdale line. The eighth cousin twice removed of Kurt Cobain, through the Davenport family. The app says we both descend from Davis Davenport, the progenitor of the Virginia Davenports from the Pamunkey Neck region, but his line of descent — Davis to Ann to Eleanor to Polly and so on … well, let’s just say that more evidence is needed to link that line in to this group of Davenports. It’s not impossible; I do descend from Davis, and if Kurt does, well, hey… I like cousins. So… do I buy this? Then again I didn’t have to. Just don’t call it genealogy. Because, for the most part, we’re NOT related. And an app doesn’t make us so. I found that it does actually work, it says that Barack Obama is my 8th cousin, mutual ancestor is Joseph Collins in Virginia and indeed I have Joseph Collins in my tree, it also shows the descent down the generations to yourself, very cool and I highly recommend people try it! It has worked for you in this one case, yes, but that doesn’t mean that it really works for everybody… It’s certainly not genealogy. It missed the one famous cousin of mine entirely. Robert Duvall…and this line is well researched! From reading the comments, the app has caused many people to study the results to determine their accuracy. The definition of genealogy is ‘the study and tracing of lines of descent or development’. So tell me why this is not genealogy. It’s not the checking-to-see-if-it’s-accurate that’s the problem. It’s the accepting-it-without-question-even-when-it’s-patently-ridiculous that’s the problem. I think it’s safe to say that every “Genealogist” (with a capital ‘G’) knows to be in the checking-to-see-if-it’s-accurate camp, for everyone else they’re going to believe whatever they choose. Whether they hear it from We’re Related, or from their mom who says they’re 1/16 Cherokee and Johnny Appleseed is a distant cousin. A tool, is a tool, is a tool. It’s only as good as what you do with it. I have found it to be helpful in filling in some gaps. It gives me a thread to pull and a couple of them have been very useful and I’ve gained some great insights into missing parts of my family tree. Others were unhelpful but I didn’t lose anything by diving deeper It’s purely entertainment, I don’t really care about who it links me to but if it can help me fill in some gaps- never assuming that the info is accurate, like I said, it gives you some threads to pull on. I think some are missing the point. #1. It’s a fun app. #2. It can be another research tool. #3. Like any other data you find, taking it at face value is never a good idea. ALWAYS do the work to verify information and if you can’t follow the trail with your own research, don’t include it. A year on and I still have results pop out every few days or so.I believe they stretch it out this way to hold our interest and also because people are constantly adding to and altering their trees. Most of them are provably correct, through a little research, and a couple of them have yielded long mysterious parents and spouses. If I can take a line back even one generation, I will grab that twig. The few errors – and I’m pretty certain that I caught them all – are a result of errors on other subscribers’ trees. Of course it works sometimes. A stopped clock is right twice a day too. It’s not saying that you are absolutely related. In fact, it says at the bottom “does this look right to you?” You can easily research the shared ancestor and seek documentation if you wish. All of which can easily be done on ancestry.com. If you find that the shared ancestor is incorrect, you just click on no and they will be taken off your list. It’s not that hard! So, yes the app actually does work and it’s very easy to verify. Believe whatever you want about the app. If it gives you useful hints, more power to you. It has done absolutely nothing for my research. Every single line I’ve checked has been so wrong it’s not worth wasting my time. It states very plainly that you MAY be related to those persons. It does not say you ARE. It’s 85 to 95% correct. It’s not suppose to be the end all. In fact, it’s to be considered a tool…to help you weed out the inconsistencies. I’ve found a lot of family/cousins/otherwise through this app, but of course, I had to check via my tree, their tree, etc. Just because it doesn’t match up per se, doesn’t mean you’re not related to that specific person. People write in all kinds of things when doing their genealogy. That’s why genealogists and those hunting for their ancestors sometimes have a difficult time, because when they came over from other countries, they sometimes changed their names or the spelling of their names. Sometimes, the names were pronounced and the person writing them down simply wrote them down the way they sound. I have a great grandmother with a name that SOUNDS like, Von Schaub…Was it spelled that way? Heck, I don’t know…I can’t find her anywhere, so my guess would be a staunch no. Also, coming over from Austria meant that she probably spoke some German and they generally spelled any names with the letter V as W…Like Edelweiss doesn’t pronounce the W…they say it with V. Like EidelVISE. If you’re finding it 85-95% accurate, all I can say is… you may want to doublecheck your research. It shows Barack as my relative as well. However, I tried connecting us in reverse building a proxy tree from him and attempting to connect the dots back to me through the path they provided. It fell apart pretty quickly before he reached our alleged common ancestor. So, even if you can establish your link to the provided MRCA, that doesn’t mean you’ll be able to follow any verifiable path back down the other branch of the tree. Yes, I ran across the same issue. It has been thoroughly researched that I am related to Loretta Lynn. More surprising is the ease of the connection, which the app did not pick up on at all. I do have to say though, the app is quite entertaining. I wish you could click onto the different names from the line of descent from the MRCA, where you could conduct further research. I was enjoying the app until I decided to see if my husband’s tree would yield some relatives. That was a mistake. It now shows my(with my photo) as my stepson, and his mother some person not on Amy of my trees! What a mess. I tried uninstalling, closing iPad, and the errors are still there. Apparently there is no way to reset!! I reset the iPad and that seemed to work… plus I ignored the app for a few days. But it really is annoying. I tried We’re Related too, right off the bat it told me I am not related toy daughter… Then they told me that I had a grandma whose name was Helen? When her name was actually Emeline ! I spent several years finding my relatives and big BUCKS with their CO. and then to get this hog wash.
You don’t pay a penny for this app; it’s entirely free. Excellent! In some cases, of course, the information will turn out to be correct. As long as you carefully verify everything, it’s fine to use anything at all as a hint. What we can’t ever do is simply accept without checking. How did you find info.? As Lincoln also showed up sharing of my dna. While this app is not really accurate we are all actually related. Yes, we have an extensive tree going back to 1200 in many directions and I did find it to work in most cases. The more you have of your tree the better it is. I love this app. The only ACCURATE trees back to 1200 — if such a term can be used about trees back that far — would be direct royal lines. Most people aren’t descended from the royal lines with that kind of documentation. They throw fake relatives in the mix so you do your ancestry and check it. There may be some relation in the mix, but for the most part everyone get the same ancestors that you see above that they weed out. You also have to realize that America’s population was relatively small up until the 1950’s, so the chances of being distantly related to someone is pretty good; especially if you have a good imagination. I’ve been working on my family tree for several years. I Google the Census records on microfilm as it is the only true and unedited way to preserve documents). In addition to census records, I collect birth, death, marriage, baptism, and military records. My DNA is uploaded fo several sites that I can use to confirm the records and surnames. I love research and I am meticulous. That said, I was able to confirm that We’re Related was accurate with my connections. Now, I used the same process to do a quick check on two of my “famous” connections. I started with their Autobiographies, which usually includes the names and location of their birth parents and places where they lived. After gathering those details, I did an old school search. The names provided as their connection to the same common ancestor matched up. That’s all I know for certain. How or why, I dont know, but anything is possible. I wouldn’t discount its accuracy based on my own research. As noted, individual cases — particularly when you back into well-documented lines — can be just fine. The majority however are … um … not. Use the information however you wish, but again I’m not recommending this as a research tool. Not ever. The app says that I am the 7th cousin, 1x removed of Donald Trump. I am, in fact, his 7th cousin, 1x removed through his Scottish mother. And, no. I’m not happy about it… Does the app get it right every single time? Of course not. However, it is careful to use the word “possible”. By the way cousin Judy, you and I share Clinton, Obama and Demi Lovato. I’m looking forward to the family reunion. LOL. Thank you for the information. I’ve had someone telling me about all the famous people we are related to. I started having doubts as the list grew. Hillary Clinton – 6th cousins 1x removed. The support for this app clearly says that it relies on Facebook in order to work. I’m very skeptical of this kind of app trashing the careful discipline that genealogy is. Someone showed it to me and stated, “I didn’t even have to do any research, they did it all for me.” No, one of your relatives did it for you and you should be thanking them, not some stupid corporation for exploiting other people’s hard and under-appreciated work. Having that said… apparently I’m related to Michael Jackson. Cool! My experience was pretty much the same as yours although I used the BYU site rather than the app. I did find an ancestor that Harry Truman shares in common with me. The only problem is Harry’s genealogist apparently doesn’t know he had this ancestor. Too bad. I’d be happy to be related to Harry. How embarrassing! We can’t find any relatives for you yet. You can increase your odds by doing a few more things. Yup, how embarrassing, Ancestry! I do have proven relative matches, detected by Ancestry in tree matches & DNA matches … but this app couldn’t find them? There is a site called relativefinder.org that links through familysearch.org which does the same thing. It is primarily for entertainment not research. Because it uses family search, you need a tree built there to get good results, and you will probably find a good number of figures in the LDS Church. So I can claim relation to Joseph Smith, Brigham Young, and even current day church leaders like Dallin Oaks and David Bednar. Another feature is that you can create private groups to see if you may be related to others in that group. Interesting to know, but as I said, not research. Just installed it to see what it would find. It showed 5 relatives… Michelle Obama, Lady Gaga, Bill Clinton, Eminem, and Brittney Spears. No historic figures, just these five people. In contrast, Relative Finder came up with just over 750 notable people I am related to. If you believe any of this nonsense, I have a bridge to sell! According to the app, I am related to all of those same people, PLUS Barak Obama. Do they keep the information if we delete the App? I just wanted to play with it. I came up President Obama too as a 8th Cousin through Peter Stroup 1728-1804 who I have no idea who he is! I got a quick giggle! Yep, Obama is my 8 th cousin too, lol, as well as Donald Trump and Michael Jackson and Brittany Spears, WOW. But when I trace the line, it doesn’t fit the facts. Was fun for a while… got me doing research again which was a good thing! Few of these supposed relationships actually fit the facts… but it’s amusing anyway. Seems we’re all related by Obama or Britney or the Clinton’s. I do see a common theme Democrats or Britney will be the first female president! Which is more likely than me being kind to Obama or Clinton! The app also shows just about everybody related to the Bush family — including those of us who aren’t (and even those who don’t want to be). I think it is kind of fun — will I immediately add all these folks without research — no way. One comment though is that it does NOT require you to login with your Facebook id — I just skipped (declined) that and it continued on to my Ancestry ID. Actually, we’re all related somehow, someway, it’s just a question of how many generations up, down and sideways you have to go to get there. And maybe we don’t really want to know some of the people we are related to? These apps — and this is not the first of it’s kind — don’t go looking for how you might be related to Billy the Kid, for instance, or Ted Bundy, or Charles Manson. I haven’t had any criminals come up so far Judy. Darn! However, I’m related to so many Presidents….who knew? LOL! I enjoy seeing who pops up each day. There are two of the lines that may have some hints for me to follow. I just haven’t taken the time yet. I have one word. Groan. Ok, so maybe a few more words too. I’m very tired of these companies taking advantage of unsuspecting and excited consumers to propagate bad information. I did not try this app, but I have to agree big-time with Roberta Estes. This just sounds like it perpetuates bad information, without facts to back up anything. I agree with Roberta’s comment and I appreciate the heads-up about the app. It perpetuates bad genealogy and makes me annoyed that Ancestry.com, which offers an otherwise useful service, tries to entice people into becoming members with garbage like this. I also turn the sound off when their commercials come on the TV! This is an app that I will pass on. I can find my own connections, thank you Ancestry. There is already plenty of nonsense in trees as it is. I have, through reseach, found connections to several politicians including President Lincoln and an actor/comic, Chevy Chase, as well as others just though normal research. I shudder to think what might show up if I use this app. I also have no intention to ever connect to Facebook with my phone. I already have too many annoyances on my phone, I have no tablet. Still, I suppose this app will be a lot of Fun for many. I do stongly suggest that you do your best to prove the connections it comes up with. The app seemed to already know my Facebook account and wanted to use that for the app but I used the “switch to” link to log into my Ancestry account where it found me as the home person in my tree and used it to find my famous relatives..well maybe or maybe not. I know for fact that I AM related to Richard Nixon, Barbara Bush, William Penn, and Merrill Streep (who is also related to William Penn through the same line) but it didn’t find any of them. It told me I’m related to Johnnie Depp (so I guess that makes us cousins), Matt Damon, Kristen Stewart and Benjamin Franklin. I have to wonder…I have a Benjamin Franklin in my tree but he is not THE Benjamin Franklin…he is my 2nd great-grandfather’s brother’s 2nd wife’s father. Ya think? Yup, and proof positive of the old adage: GIGO (garbage in, garbage out). Ancestry? Aren’t they the folks who discontinued supporting Family Tree Maker? What are they doing, shifting from the genealogy business to the entertainment business? [Remember that Singer does not make sewing machines anymore, and Western Union no longer provides telegram service.]. Oh boy…so many people will assume all this relationship info is correct becUse the app said so, and this garbage will get added to their trees on Ancestry, perpetuating the errors over and over again if I don’t have the paper, no dice. Almost makes me wish I had a “smart” phone so I could try it out for a laugh. Almost. Well, according to your blog post and the APP we might be related. Cant wait to see of this APP adds how GeneaBloggers are related to GeneaBloggers like the BYU Relative Finder and Family Search Family Trees did. The Facebook connection, there has been times when an Ancestry Member Tree will find a Facebook Connection. Not sure if it is still around, but I have seen some of those Facebook connection. I had a Mayflower rep at RootsTech2016 take me to the BYU/FS terminal and showed me how I was related to a Mayflower person. No further comment on that. I think I blogged about it. Randy Seaver asked about the “source” / database(s) that made these connections. Each time, I take a look and move on. However, if I had the time, or wanted to add a problem to one of the class I teach, these connections might be a great example for GPS. Can the student PROVE that connection. I did one from the BYU/FS and actually made a connection to a famous person. I was able to document the connection. Thanks for this Blog Post on this topic. No Mayflower, or even northern US, ancestors forme, Russ. As far as I know all of my mother’s side was colonial south. If your Pettypool line came through Lunenburg County, VA or Williamson County, TN, you may be related to my cousin. Shucks! I was almost kin to the famous Judy G. Russell! Good fun. Thanks for the post. The Pettypools were in Lunenburg! I agree. You would think that Ancestry would care more about quality information in genealogy and get rid of this abomination before it completely pollutes the pool. Ancestry’s old mess, OneWorldTree, had a component for finding connections with famous persons. It even continued that program after discontinuing OWT, until a year or so ago. Maybe this new thingie is just a version of it, possibly using OWT as part of the reference database. Eccch. Entertaining? I think not. I can make up lies to entertain myself all day. I think I’ll tell myself I’m related to Warren Buffett and ask him for a loan. The app said I was related to Bruce Lee, the martial artist and actor. Possible, his mother was half German and his grandmother was German. Trouble is, the mother they identified isn’t his mother, which screws up the entire line back to our common ancestor, my 6th great grandmother. Bruce Lee’s mother is very much identified in every bio about him. Her name was Grace Ho. Not Lorraine Roby. I can’t seem to find this app on Google Play. I suspect it’s only available in the US. I am in Canada and I found it on Google Play. I agree — this app is lazy genealogy, and I’d rather use my time doing research. But I especially enjoyed your column because YOU may be a cousin?? You mentioned Elizabeth Markham. I have one in our tree, b. 13 Jul 1673, daughter of Daniel Markham and Elizabeth Whitmore. Same one? If so, please contact me because I have a brickwall I’ve bruised my head against for years and you might have my (verified) answer! I look at the app as a launch point for deeper research and the potential for taking your tree back a generation or more than you may already have. I got Jimi Hendrix as a distant cousin. Well, since I am a pale faced girl of Northern European ancestry I decided to check that one out! Well, I was able to disprove that one pretty quickly. On the tree it showed my fourth-great grandmother Keziah Tyler as being part of the family that produced President John Tyler. I disproved that connection years ago. Poor Keziah was attached to the presidential family generations ago and her true origins are lost. Going back a few generations was the “common” ancestor I supposedly shared with Jimi Hendrix, who did have a white great-grandfather. Well, the app crapped out on me and I lost all but one of my “matches” – Britney Spears who I was able to verify as a distant cousin. If the app were doing more than conglomerating faulty research, I might agree with you that it was a launch point. As it is, it’s just entertainment — and fiction at that. I discovered a possible connection to a former school mate…we are planning to work together to connect the dots. Good luck. None of mine are more than fiction. Hilarious! But still it’s interesting in that it highlights why many people dabble in ancestry, i.e. they want to find out if they’re related to someone famous, as if some of that DNA is in their own genes. I find it all a bit weird, like medieval aristocrats thinking they really had blue blood. No, they they just had an airtight network of political control. I first learned of the app through a Facebook friend. None of my friends who I am aware have tried the app believe they are really related to the famous people that the app alleges. While the real genealogists might not agree, I do think that a positive point of the app is that it seems to hook in those who might really be interested into learning about their family history. I’m a paralegal and love researching and digging deep for information, and I can see myself becoming a little obsessive about real genealogical research, if I had the time or a desire to do so. I do not really believe that I am related to Michelle Obama, John Kerry, Benjamin Franklin, or Winston Churchill, as the app suggests. However, it does make me curious about my paternal grandmother’s lineage, from whence all of these alleged “connections” were made. FWIW, It might be kind fun to disprove the relationships and correcting my family tree, while learning how to perform real genealogy research. I do have some relatives who do the real research, so I’m thinking I might need to touch base with them. The app says I am related to those very same people. We’re Related! But I am not sure I buy into all of this either. I’m going to investigate, as it seems to have “solved” some of my brick walls. I will look for real evidence of the connections. Using it for hints is just fine. It turns out that I’m pretty much everyone’s 9th cousin. What’s crazy is that my closely related cousin, who is a very well-known entertainer, didn’t show up! Lol! Just downloaded it and ran into questions right away. I am going to just check one “new” generation back on each suggested famous relative and research the connection in actual records to see if it holds up. Hoping to break through a couple brick walls. It’s definitely entertaining. What it probably isn’t, is genealogy. But it’s fun. Wow! I am jealous of some of y’alls connections. I did Barack Obama, Michelle Obama, Michael Jackson, Bill Clinton and Miley Cyrus. I have to agree with Judy G. Russell that the app is not researched at all. It was showing me ancestors past my father’s father, that I cannot verify at all. Someone else said it best. “It got me back into researching my genealogy”. It had me right away digging. I wish I had all my papers with me at work so I could really see. If it’s getting you back into research, then it can’t be all bad, now, can it? Any of these things can provide a hint that works out. The question is, how often? After all, a broken watch is right at least once a day as well! I, however, beg to differ. It claims that I am related to Mark Ruffalo through the Arsenault family tree, of which, I am related too. I recently got into legitimate contact with Mr. Ruffalo and he claims that this the connection between our families is legitimate, we also did a DNA sample together and we both have the same traits from the Arsenault family, which we needed from a pure-bred Arsenault, which aren’t that hard to find here in Michigan. However, I for one would enjoy engaging more on this app and it’s opened up plenty of doors for my family. Now, obviously, without an actual statement to back me up, you’d most likely think I’m lying. Which I probably am, but I can show people a specific picture I found in Nahma, Michigan where the workhouses were for Native Americans. I will support Judy Russell however, being that I am related to Mark Russell and I’ve made that quite clear I believe, however, when I put in a certain ancestor’s surname, (for example; Moses MacAbee) it shows up as Moise MacChabee, and I don’t believe that’s my great-grandmother’s surname either being Anne MacAbee. 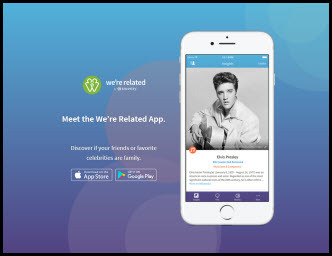 It’s a good app to open up the possibilities of famous relatives, but it’s not the greatest app to use when you’re searching for relatives. Now, I also put in names on Ancestry.com (obviously, on a family tree I made up so it wouldn’t mix up with the one I’ve been working on for a year straight) and there are thousands of leafs that I found about them including their children, ancestors, SSN, etc. I went into research and used A LOT of internet websites that included my ancestors from Belgium, Germany, England, Ireland, and France, and they seemed legitimate, those are the ones that I put into my family tree. This app is fun and exciting but is only as good as the information that Ancestry users enter into the system and, unfortunately, they enter a LOT of incorrect information. I’m amazed by the inaccurate info. With this app, you just have to prove the connection with documentation (birth records, etc.) of your ancestors. It’s not surprising that some lines will be correct — old New England lines in particular. But then a stopped watch is right twice a day as well. I view this as a tool and that’s it. Yes it can be entertaining, but it’s not going to add me to Bill Gate’s will (even though it show’s me as his 9th cousin). However, like any other genealogical tool, it gets you thinking about a possible connection you hadn’t considered before. About as reliable as hearing from your Aunt Bertha that she was told as a girl from her Great Uncle Bob that the family once descended from King George III. Who knows, there may be some truth to it. If it’s a line you’re interested in working then it’s well worth following the rabbit down the rabbit hole. At least, with We’re Related, the lines have been looked at by someone who had some amount of interest in genealogy, rather than Great Uncle Bob who just wanted to make the family sound impressive. I think I’ve found one or two that are at least plausible. Others, patently ridiculous and provably so. I installed this; but there is an error. It has skipped a generation between my paternal grandmother and me. I am NOT her daughter. It is missing my father. The app also said I was related to Presidents Obama and Clinton, Johnny Depp, Kurt Cobain, Kristen Stewart, Eminem, Miley Cyrus, Derek Jeter, W.C. Fields. Totally not true!! Where do they get this stuff? Will not believe any of it. Truly look just for fun. I found it interesting that today it told my daughter and I that we were not related. As far as I am concerned, this isn’t even entertainment. How is that possible? It doesn’t say anything about who is ‘not’ related. I hear what everyone is saying about the accuracy, really I do. But on the other hand, the app clearly labels matches as “possible relatives”. Like genealogy in general, it is then up to you to do the math and decide if you think it’s right or not. And in the app’s defense, it does ask at the bottom of each path: “Does this path look correct to you”? Not clear what Ancestry does with your response there. Perhaps they just remove that as a match for you, if you don’t think it’s right. Or perhaps they maintain stats on each path, and use some heuristics to decide on matches. Obviously you don’t want to use a path if 95% of people say it’s wrong. The app may very well get “smarter” as more and more people answer the question. I also suspect the accuracy is going to be affected by the size and accuracy of your own tree. I got 5 matches for famous people, and some are clearly true, while some I know to be suspect. But based on the information in my tree, it made reasonable matches. I know which paths in my own tree are solid. I would need to verify the paths it shows to the famous person. Remember, that’s only as accurate as the public trees on Ancestry, which are for the most part entered by people like you and me and have tons of mistakes. I was a little surprised at some matches that it missed. For example, I am related to President Grover Cleveland, and it’s well researched and can be shown quite easily, and in fact the entirety of both lines all the way down to Grover and me are contained in my own Ancestry tree. So how could it miss that? Another thing that puzzles me is the different lists it comes up with for different people in my tree. For example, I told it to use my mother, and it revealed that she was related to Mark Twain. Well, if my mother is, then I should be too. Yet Twain does not show up for me. I wonder if the app has set a limit of 9th cousins, to keep things from mushrooming out of control (obviously if you could go back enough generations, we are all related). For example, Twain is shown as my mom’s 9th cousin. So his relation to me requires one more generation, which perhaps exceeds some limit set by the app developers. But… here’s one I can’t explain. I set the app to use my daughter. It then claims that Abe Lincoln is her 5th cousin 7x removed. And her path goes through me! Which means that I must be Abe’s 5th cousin 6x removed. And yet the app does not show Abe as related to me. That one makes no sense at all. I think there is a very simple explanation for your “missed matches”. It is my observation that the app is designed to provide the matches on a ‘trickle’ basis. It typically only gives one or two new matches every couple of days. I found this the hard way, when after a couple of months of receiving matches (and being conditioned to check for new matches every day), I accidently deleted my account. So I reset it, expecting to be shown all of what it had found previously. No. I basically was given the initial 4 or 5 matches and had to start the whole daily feed routine all over again. Interestingly, they’ve come in a different order this time. Now, with 138 relations listed, I’m nervous about making any changes to the app for fear of having to restart all over again. In all, I’m very happy with the app. For all it’s flaws, which have been mentioned previously in this blogs comments, I think it is a fun tool for doing genealogical research. My main gripe about it though, is that it doesn’t allow us to click on a parent/child connection to see an Ancestry tree (or user) where the data is coming from. There should be some way to see where in the Ancestry databases they are getting the information. I too have the app. Two thoughts: I have not ‘trusted’ the app. However, I have it to guide me up the tree to the common ancestor. With it, I have found it to be pretty darn accurate, going up the tree. It really tickles me to see they picked Joe-Schmo as my GGGG father and Ancestry’s documents verify it’s true. On the other hand, rarely do I find the data accurate, going back down the fame side. I have done my DNA, which has verified my research. In 15 out of 17 matches, the app has been correct. I’m more impressed with the up-tree accuracy and love it that it points me up a line I may have ignored until I got the fame hint. I have used the app, I have been studying my own tree for 25 plus years. I was born in Southern OH and was not reunited with my biological father’s family and meet my 4 brothers until I was in my 20’s. This led me to study the tree. My family loves me, but they won’t discuss it even with family. Our family is closely related to many celebs, presidents, Inventors. I got my family to verify the results and asked why they didn’t tell me. They gave me many reasons. The trees Ancestry.com are using in this app arefrom Their one world tree. I have seen minor mistakes in the trees, but it is pretty accurate. If one wants to verify the results without paying, most libraries have Genealogy resources including Ancestry Library Edition. The one world tree is appallingly bad in many respects. If it happens to be decent for your ancestral lines, that’s almost an accident — much more the exception than the rule. Judy, I normally enjoy your blog a lot, but I think you really missed the mark on this one. 1) Sell more subscriptions, make more money? Shoot, can’t hurt! 3) Anger every uptight genealogist on the planet? Uh, no. 3) Create a fun way to interact with family and friends, while engaging young people through a medium that feels comfortable to them in an effort to also spread the thrill of genealogy to a new generation? DING DING DING! How many young people do you know that are into genealogy? There are certainly a few, but I would wager that the primary demographic for genealogists (amateur and professional) is considerably further north than the target market for the app. So, by denigrating the app, and making it out to seem like a total piece of rubbish, you’ve succeeded in drawing people to your own blog, but you haven’t really done a lot to further the field of genealogy, which is REALLY the mark we should be aiming for, when we get right down to it. Plenty of people had great feedback for you above, but one of the big problems, I have is that by your own admission you wrote the blog the day after the app came available. If you have since revised your opinion, then you should revise your blog. The title is sarcastic and off-putting and the tone of your blog comes off as holier than though and … well, yes, negative. Which reflects negatively on you. If you are that down on the Ancestry service, why do you use it? Perhaps you don’t, but if you do … quite hypocritical. As for the app … the Ancestry folks make it clear up front that it is for entertainment purposes ONLY. It is curious that you leave that tidbit until the end as you were ripping to shreds everything else they wrote. Thanks for counteracting a movement that was likely calculated to groom future genealogists to carry on the work that we have started. Do you think that anyone will be interested in utilizing the WR app, or perhaps making the jump to the ancestry app after reading your blog? Seriously doubt it. Do you think you are engendering yourself to the community that you likely created your blog to serve? Or did you create your blog mainly to share your thoughts without concern for what anyone else thinks (Transmit only, receive is broken)? I would examine these motives, because if you created it for the reason most folks create a genealogy blog, this entry is a massive fail. You should rethink what you wrote. Perhaps, as you write you should think about what is best for the community. I know this response sounds negative, so I apologize, but I’m in a hurry this morning and I couldn’t find too many ways to put a positive spin on what I just read here. Best of luck on your future endeavors. Hope you’ll consider what is best for the community. Thank you. I cannot for the life of me imagine why anyone would think it was “entertaining” and “engaging” and “fun” to give people the “thrill” of bad genealogical information. The app is almost hopelessly wrong in a huge number of these supposed relationships — doing ridiculous things like giving one woman two mothers. It’s not doing the genealogical community the slightest bit of good to get people excited about things that can’t possibly be so. This blog isn’t intended to be an uncritical cheerleader for bad data, bad research or faulty reasoning. I haven’t changed my view on the app one bit and, until and unless its underlying data is validated and accurate, never will. My view of what’s “best for the community” is adherence to the Genealogical Proof Standard: a five-element system involving reasonably exhaustive research, citation of sources, analysis and correlation of data and (ding ding ding) resolution of conflicts in the data all of which come before writing up a sound conclusion. Your mileage may vary. Corey your reply was very insightful. You bring up some very good observations about the WR app and its ability to motivate new minds to consider this thing we call genealogy. Judy, I was very disappointed by your reply to Corey. I naively was expecting you to have a change of heart. You truly appear to be very closed minded towards new ideas. You state that your view of what’s best for the community is adherence to the Genealogical Proof Standard. I read that and I hear the haughtiness in your voice. You say that to anyone just considering doing some family research, and they will be running out the door in a heartbeat. Don’t get me wrong, those standards are absolutely necessary; but at least give new recruits some time to get their feet wet and make mistakes, as we all have. Your statement leads me to believe that you would have every online database removed from the internet. Because, in case it hasn’t occurred to you yet, the WR app is only passing along what is already available on Ancestry’s website. Yes there is flawed information there, and in EVERY other online genealogical database. Heck there is flawed information in every genealogical source – period. I suspect that if you had your way, and only the data that met the Genealogical Proof Standard was shared, then there would be very little information available. As I’ve said in reply to a different post on this thread, the WR app is only a tool. I have to agree with Corey that it is a very creative way to motivate new minds within the next generation of researchers. Please allow me a chance to share my WR experience. I’ve been working on my families genealogy for about 38 years now. I’ve cranked through countless feet of microfilm. I’ve spent weeks on end waiting for that one fiche to arrive from Salt Lake just so that I might find proof of what ship an ancestor may have arrived on. I don’t miss those days. Ancestry and their massive data systems have opened new worlds. Admittedly it would be great if they would do more to get researchers to document and prove their findings better. Hear that Ancestry? Now, about the WR app. It is a new tool that opens new worlds. Yes, I too have come across the individual with 2 mom’s. Obviously, at least one is wrong. Maybe both. But hey, its a point of entry for further verification. I’ve also found in the app where a child was born before their parent. Go figure. Obviously that too is wrong. Those are the glaring mistakes. But there are, I believe, considerable more examples of valid information just needing to be exhaustively researched, cited, analyzed and correlated. With regards to the information from the app, I keep track of every connection they show for me in an Excel spreadsheet. Both up my line and down the other side to the famous person. I really don’t care about the line leading to that person, but I keep track of it just for grins. It’s the line going back from me that really excites me. My pedigree on my moms side has always been a mystery. For decades I could only go up to my grandparents and even that was debatable. Then DNA came along and I could finally get it back 4 generations, into the early 1800’s. But now, thanks to 8 months of the WR app, I have many “potential” lines going back into the 1600’s. I now have years of validation work ahead of me. Will there be blind alleys. Of course. But that has always been the case with genealogy. At least now I have identifiable names, dates and locations to use as clues. I am grateful to Ancestry for thinking outside the box and coming up with this very creative app. It is a very innovative way for them to exhibit the vast data mine that they have. My only gripe with the app, and I shared this with them on October 25th, is that it doesn’t enable us to click on a parent/child line to find the source of the information. That, in my mind, is the biggest weakness of the app. As Corey said, you really should rethink what you wrote. Rather than closing your mind. Instead you say you haven’t changed your “view on the app one bit and, until and unless its underlying data is validated and accurate, never will”. Well, I would argue that data can’t be validated unless it is disseminated first. I don’t think I can wait around for you or anyone else to validate my lines for me. Thanks, for this blog that you share and the time that you devote to it. Since discovering it, I have learned many new things. I find the topics very informative. Please keep it going, yet also try to be a bit more open-minded. I have absolutely no intention of changing my views on this app. Sorry, but if you want to tout bad research tools using bad information, you’re going to have to find another forum. The app is not even entertainment, since I find nothing entertaining about telling people things that can’t possibly be so. Wow. “not even entertainment, ** since I ** find nothing entertaining”. Wow. This app worked for me pretty well – maybe they’ve improved the app since you wrote this? For the most part it added people related to already-confirmed relatives going back several generations. Many branches of my family tree are extensively documented, and all the connections I’ve seen are to documented family tree members. The ancestor matches also actually helped us clear up a more recent (1800’s-era) family mystery, as we couldn’t figure out who connected various families – turned out Jim Bowie (of Bowie Knife fame) was the missing link that we didn’t have until seeing him show up in some of our ‘we’re related’ apps, and now we can flush out another branch of our trees! I still haven’t confirmed all the other matches completely, but they all roll back to a known ancestor related to me, so it wouldn’t surprise me if all can be confirmed. There is similar functionality, but going much further back in the National Geographic Genographic software which they call ‘Genius Matches’ – Those I find more dubious because they go back thousands of years – for example my match to Abe Lincoln is from an ancestor 120,000 years ago, or Napoleon from 45,000. At some point we’re all related if you go back far enough!!! Folks, feel free to play with the app all you want. But don’t ask me to endorse it, speak well of it, or even enjoy it. I think what we have here is the equivalent of looking at crystals in a museum case and calling it geology. Many of the crystals are as labelled, but here and there a careless displayer switched labels, or mispelled a mineral’s name, and now we, without a geology text in sight, must believe or not. One never gets into the joy of locating a good source, or of debunking a bad one. It seems to me that a lot of what is displayed comes from the ancestry public trees, and are not vetted by anyone more informed than we ourselves. I seem to be able to verify about 30%, and another 30% if you allow for wishful thinking. Note further that relationships to these “famous” people may be fun, but its not very surprising. Back at the time of Charlemangne you had more than a trillion (a thousand billion) ancestors. If Charlemagne wasn’t one of them, THAT would be something worth talking about. Having done some fairly serious genealogy, I agree with Judy about its utility to advance the field. I would be delighted to get as high as 30% accuracy! I think what many are missing about the app is that it not meant to be taken at face value. Many of the possible relatives turn out to be wrong, due to other family tree mistakes. The app uses information already on Ancestry, e.g. if someone listed Joseph Jones as their 3x great-grandfather, it is up to you to make sure that it is the same Joseph Jones in your tree. 1) I follow my line up to a relative I don’t yet have in my tree, then go forward one generation and get to work researching. On this side of the relation, you’re working back, collecting information only on one parent of that generation. If indeed Joseph Jones’ father was Joseph Jones Sr and the app lists the same, voila! You have extended your family. If the app lists Samuel Jones as Joseph’s father, you’ve hit a dead end. 2) A dead end means the relation is no longer possible. At the bottom of the page is “Does this path look correct to you?” If not, click the thumb down and then you can hide the person from your app feed and move on. If so, keep researching up to the common relative. Be vigilant! Do not take weak possibilities or just one family tree’s info as the truth. If 20 family trees have Joseph Jones Sr. listed as Joe Jr’s dad, but one verifies the link to Samuel Jones, it’s likely that the majority rules. 3) If you made it to the common ancestor, it’s time to start working forward again. Now, while every person has 2 biological parents, not everyone opts to have 1 or 2 children, especially in Colonial America. There’s a greater probability of mistakes on this side of the equation. For the most part everyone listed down to the famous person will be new to your tree. Do the research. 4) If it works out that all links are correct, the dates match up, and your tree is filled out properly, congratulations are in order. Click on the red heart under the relative’s portrait for favorite and start bragging. I like this app, but it’s only about 50% accurate. Use with caution and be intrepid. I’ve played with the app, and it’s fun, as it gives new matches every few days. I haven’t found any that are correct yet, but there are hints there that might help break through a brick wall or two. I haven’t any other clues on those dead ends, so I’ll see where these lead. Yep, hi, cousin, indeed! Davis is my 7th and 8th great grandfather, depending on which of my 4th great grandparents I trace through… David Baker’s mother Dorothy was a Davenport (Davis -> Martin -> Dorothy -> David) and his wife Dorothy Wiseman’s grandfather was a Davenport (Davis -> Martin -> Thomas -> Mary -> Dorothy). I use the app and have found several famous relatives and some that aren’t related at all. I do take the time to trace my tree then make the connection down the famous person’s tree. There are some that are true connections based on birth records, marriage records, etc. Others I have no way of making a connection and simply remove them from my list of potentials. I am related to Mickey Mantle, The Bush family, Barack, Abraham Lincoln, Helen Keller, and Winston Churchill. Also, one interesting thing it showed me was my mother and father were very distant cousins, neither had any idea. It showed my first cousin once removed as a sixth cousin five times removed. I thought this was odd and traced the lines back and yep. The relation was showing down my mother’s line, instead of my father’s as expected. Particularly for those from certain old and well-documented lines, the app may work… sometimes… maybe. For the rest of us, please… stop already yet. It’s awful. It’s worse than undocumented hearsay. It’s silly and it’s almost always wrong. I like this blog. Actually out of about 270 famous people I have about 8 that I can confirm as being accurate. I know Lizzie Borden is because I have researched my lineage with that family and also my DNA links that family line. As Judy said, this app is to only be used as a ‘hint’. To blindly believe all the connections is a path that leads to nowhere. It is only as good as the sources and documentation that back it up. I have noticed over the past two weeks I no longer am receiving notifications about new potential notable people. It is a fun app but one I take with a grain of salt. My frustration is that my great grandfather was adopted. My tree clearly states who his parents are. Hidden under other information it does show the names of his adopted parents. All this app shows are connections through his adopted parents. That is so frustrating. I pointed that out in the comments section where they ask you to do those things but a week later and there is no response. It should show me as related to Obama – we are 8th cousins once removed. Share “Ulrich Staley” as a great…great grandfather. I’ve found the app helpful – but just not to blindly add people. I look at each line as I get the notifications, and then research the person above who I know is accurately in my tree. I’ve actually been able to break through a few road blocks that way – but there’s also definitely some faulty stuff on there. I think it essentially “crowd sources” the info to come up with the lines – in some cases it’s been completely unsupported for me, in others it’s been a correct name, but not related to my relative of that name, and in others – it’s been right. It will be right most often on well-documented, well-researched New England lines that have been here since colonial days. Elsewhere… um … not so much. There will always be some well-documented lines that you will match and so the celebrity will in fact be a cousin. That’s the exception, not the rule. So it shows I am also related to Kurt Cobain, Barak O, Michelle Obama, Demi Lovato, Johnny Depp and many, many others including Elvis and Marilyn Monroe… I wonder if pretty much everyone gets the same story? Most erroneous family trees online link back to old, well-researched New England families and so just about everybody is dumped into one of those lines. The minor hitch is… many of us have no links to those old, well-researched New England families at all. I’ve looked at and rejected 7 so called cousins so far. Sometimes the error is in the celebrity’s tree and I figured that whoever that person’s real relative was that they were just careless. However more recently my own lines have been incorrect, as in the don’t match the tree I have in Ancestry. The names will not even be close and sometimes one generation is born after the previous generation (the mother) died. So the level of care going into this is really terrible. Judy G. Russell, you and I have the exact same matches… Very odd! And like someone else said, why doesn’t it pick up the obvious ones? I have Benjamin Franklin in my tree, and well documented line, and there’s nothing about that relationship on the App. The ones to private can be figured out if you look up the celebrity elsewhere. Often times bios online elsewhere will have the names of the parents of those people listed so you can fill in the blank there. But, I check out all of the lines as well. I have started a private tree to trace the connections, simply so that I can actually prove or disprove the lines before adding them to my public tree. I don’t know how many I have found accurate yet as I’m just getting started. I find it as something fun to do when I need a break from the standard research on my family. We’re Related is a Search engine that searches through all the family trees they have in their data base. Most people on Ancestry just use other peoples trees to hopefully find links to their ancestor’s. So one error in a tree can get copied many times. Most people don’t prove their lines with research facts. I linked my line back to Charles Martel and Charlemagne using existing trees. Do I believe it. No. But there could be one chance in infinity it could be right. in 26 generations you have 134 million+ grand parents. And that’s not counting all their siblings who had your cousins removed 26 times. When you look at the numbers almost any relationship is a possibility. A stopped clock will be right twice in a day, too. I have had a lot of fun reading this thread. I have this app, I don’t take it as gospel. If you are a “Genealogist” i.e. : studied, titled, etc. then, of course, it can and will be an annoying app. But it is just that, an app for entertainment. Anyone who is truly interested in the connections will spend the time following it out. I am a President of a Historical Society, am a research consultant and an archivist for a cemetery district and enjoy my genealogy. Please, come down off the high horse and just have fun with it. No need to have egos come into something that has provided people (me) with connections I hadn’t seen yet. A thread to follow can turn out wrong or right. I have seen very well documented trees have sources that have errors. It is all about how many times you want to bite the apple of the tree to get to the center. I would much rather be on Judy’s high horse than on your merry-go-round. And this is the rudeness I am talking about. You know nothing about me, you have no clue, and yet you say something so off base. My “Merry Go Round” as you so cutely put it involves many hours a day digging into one piece of information to find valid secondary sources to follow up. “My Merry Go Round” doesn’t shut people down when they want to learn. “My Merry Go Round” has one rule, teach people the proper way to research and with dignity not arrogance. I genuinely do not believe anyone on here has tried to get Judy to change her opinion. She is entitled to that, and she has many valid points, but it is the presentation that causes grief. I have seen several comments that felt the same way I do; this is an opportunity to teach those that don’t know and have found something that excites them into learning. It behooves anyone with experience to take that excitement and channel it into proper avenues. But what I see is arrogance, snotty childish statements bent on putting down people who are only saying that they have had luck finding relatives listed or a new thought pattern. Anyone who uses that app or any initial source without following through is going to fall into a black hole. But again what I am seeing is a small smattering of people, including yourself who are bashers, can’t wait to make a rude comment because it is safe. I don’t know you, and I am responding to your little demeaning comment about my Merry Go Round. Well, this Merry Go Round worked for over 40 years saving peoples lives in a 911 center and taught many a new dispatcher how to do the same. In my field research mistakes could get someone killed. So Thank you very much, but I’ll take the top horse on this ride. I will not post examples of cleaning up other peoples messes online, so I could finally figure out why something didn’t make sense. Please keep your comments at an intelligent level. I am only on here because the subject matter is of interest to me. I am sure Judy is a powerful entity in her field, and I will be looking closer. I just assumed it would be a more adult discourse. THANK YOU!!! I have harped against this app since you first wrote about it! In fact, in my genealogy classes, I have a section on “Elvis Presley is My Cousin … Not.” Because of ONE person who ties into my husband’s line, I find that he and I were married three times. The only problem? The third marriage was a year after he died! And, we were only married once by the way. Will they change it? Of course not! I do not trust family trees on Ancestry.com. I trust source documents. So, Judy, keep harping on it. It might be fun I guess but .. as a genealogy tool? Sorry Charlie! I hate written word on occasion. I wasn’t offended by her statement. I found it to be childish. And I have no problem with people who are against the app. I am against the use of statements that put people down. My example, you twice used the term , even a clock is right twice a day. It was the context. The person was explaining what they had found that was correct and yet the put down. I have a very strong skin and there isn’t much that offends me. Even this attempt to define my response. All I am trying to say is use this as a way to educate instead of using words that are an obvious put down. Again nothing to do with the app. But nothing I am going to say is going to smooth ruffled feathers. You are correct, it is your blog, I was trying to point out something I thought was helpful. Your words can diminish your efforts. And yes it can be a hard fall off that horse. Been there, done That. I get your point about the app but how your are saying it is upsetting to people and that has an affect on people trying to learn. And I will go find another blog to follow. If there is seriously somebody who is going to be upset at being told the truth (the Emperor — this app — has no clothes! really! ), that’s not somebody I’m ever going to reach as a reader. True enough. Somewhat the same as trying to get thru to someone that just because they spell their surname a certain way doesn’t mean it was always that spelling. Have a better day. Eh it’s hit or miss but it definitely is the easiest way to find famous people to research if you are likely related. There is no other way I know of that will get you a new famous person to research on at least a weekly basis(at least for me). I’d say about 25% of the time it is correct or at least possibly correct. Alot of the “famous ” relatives tend to have flaws in there lineage link to me, so you need to verify everything. The handful that have worked out when I verify both lineages would have probably been impossible for the average hobbyist genealogist to come up with on the own with the online tools available to us.on occasion it has also identified correct leads to branches of my tree that I have yet to work out. If that’s what floats your boat, have at it. As I’ve said, some people will find relatives this way — especially if you can link to well-documented New England families. Me, no. Not one. Some of mine are correct…as so far as I can determine. Willem (William) DaFoe for one. But for my wife’s daughter, we get constant connections to a Johnson line…While Johnson is correct, it’s the wrong Johnson. For a mother, they show a Morgan (False, it’s a child of an adoptee surnamed Leonard, who was the daughter of a Bailey) and if that isn’t the side, they show a Johnson..But they show a Thomas, and it’s a George O’Neal Johnson, not THOMAS. It has given me some proven leads into my own… I apparently have more German lineage than I thought. It corrected me on a couple of people. But the trees are ONLY AS ACCURATE as the people who created them. It shows one of my line having 7 children and being married by the time of her death at age 4. WOW. That’s prolific! Also showed a woman with a child born 20 years after her death. Showed a man born 13 years before his mother. Lack of info doesn’t mean it’s wrong. But neither is it correct. It is a “hint” program. It could help. Or it could lead you astray. I’ve been doing genealogy for four decades, and an Ancestry member since I can remember, and take this with a grain of salt. Of course it’s not meant to be serious, and yes, I understand the serious consequences. In essence, WR is not much different than when Ancestry had a database of “famous relatives” – I forget the name they used for it – which they removed, since it was based on the One World Tree which itself was so messed up from bad information and which was also subsequently removed… I don’t like Ancestry’s system to begin with, because of the ability to spread incorrect history – which is in essence what bad genealogy is. Spreading incorrect history is Not Cool and Not Fun or Amusing and a PITA to correct, if at all possible. But we Genealogists have Always known that bad genealogy was Ancestry’s main problem! So what more can you really expect from WR? You *can be entertained by WR, and sometimes you even find proven lines. What I did with the WR info was to create a spreadsheet with all the particulars. Then when I am bored with what I’ve been working on and want something to do, I look at the people and go through the data to see if there is a potential of adding them to my tree. The ones who connect to me via PA Dutch country or my southern relatives (Minnie Pearl! How-Dy!) usually click right in, via a relative I might not have worked on previously. To me, that part is actually valuable. And it’s more valuable to anyone I match with DNA. If my branches are more complete, it’s easier for them to find the connection. It’s a bummer I’m not proven related to Captain America, lol. But until our supposed MRCA Hannah Martin’s parents are proven, I am not going to automatically assign her to John Martin. That has been a brickwall for decades, and that is really the part we all should be mad about. Whoever put John Martin as her father without proof attached is the culprit. Not the WR app. And I have a ton of supposed WR matches with that linkage. Question: I understand that everyone should do their own research on their own line, but who does the celebrity/famous person research? Obviously a lot of them are dead and can’t verify themselves, so are these famous people trees just from random would-be ancestors? Those are just drawn from consolidated and often unsourced family trees. My understanding is that the we’re related website takes the information from trees planted by us… With that said how many erroneous trees have conflicting information… Added by us… It’s like using the Ancestry . Com family tree hints … Sometimes there is 10 trees with matching info … And maybe 1 or 2 with different spouses… I have found that by doing more research the spouse I didn’t have… Was in reality… A 2nd spouse… Who they chose not to list because they were not interest into following that branch. If we’re related can give me a hint in one of my brick walls… Darn right I’m gonna check into it… I have proven to date 5 of their matches… Only had trouble with 1… Which I don’t claim at this time. Some lines are reasonably well documented and if you hit into one of those you can come up with some good hints. Others… well, let’s just say the word “fiction” comes to mind. Such bitterness. It works in some cases not in others. Like most have said do the research and you can see if it is true. Other people mess with stuff way to often to take it at face value, but just because you experince was not perfect does not mean there is no value and being snarky to those who it has helped does no one any good. It never ceases to amaze me that this app keeps getting people riled up all these months after the post came out. Feel free to defend it all you like — but don’t expect me to either back down or endorse it. Ain’t happenin’. I’ve had the same experience that most have had. They’ve got me linked to Edgar All Poe, Thoreau, Mark Twain, George Washington, Bill Clinton, Winston Churchill, a number of actors. I chose to check the validity of the closest claim, Ben Franklin. They’ve got Ben Franklin linked as a child of a 9th Great-Grandfather. They list Lawrence Franklin (1680-1764) which doesn’t fit in as a son of Josiah. There is no Lawrence out of the 17 children Josiah had out of two marriages. A false lead right out of the gates! I don’t take anyone the app tells me I’m related to as fact, but that the way it gives my connection to that person as a starting point to being able to confirm or deny if it’s true. So far the ancestor that myself and the other person share down to me have always been correct. I have not taken the time though to figure out if it’s correct from that starting ancestor down to the well-known figure.